A company that thrives for nearly a century is exceptional. A company with a product that’s a household name and brings a smile to faces everywhere, that’s a rarity. La-Z-Boy has long enjoyed such status. Few people would be surprised if, in the dictionary under “comfort,” it simply showed an image of a La-Z-Boy recliner. That iconic status, ironically, was a problem. La-Z-Boy had grown into a home furnishings company with an extensive product offering. Recliners were no longer even their largest line. In the market, however, La-Z-Boy still meant recliners. If the company wanted to grow beyond its longstanding icon, La-Z-Boy needed an extensive public makeover. Leadership got to work evolving the brand, expanding what it meant in the marketplace. They developed an updated brand identity, introduced a new celebrity spokesperson in a hip new advertising campaign, and updated company stores and independent dealer showrooms. The issues went far beyond a dated image. The work environment couldn’t deliver what people needed: open communication and collaboration, and support for changing work processes. It hampered operational excellence. Moreover, the building detracted from efforts to attract, engage and retain employees. 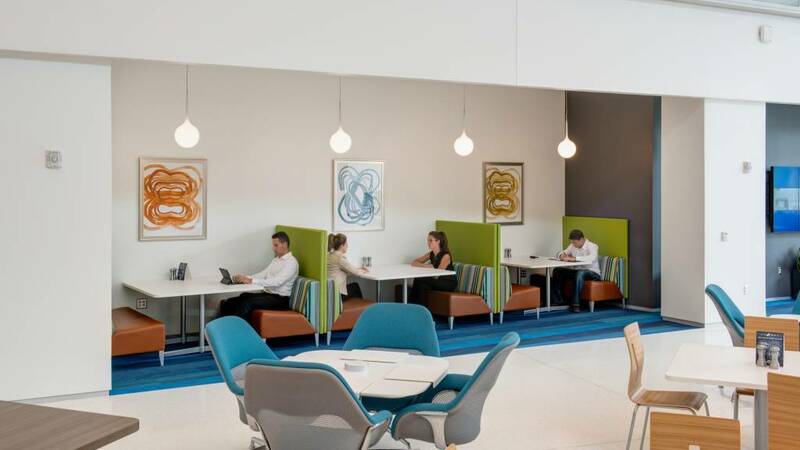 The new La-Z-Boy headquarters, at 200,000 square feet, has a 20% smaller footprint than their former office, yet it provides 500 employees with a much wider ecosystem of spaces: unassigned individual desks, a wide variety of open and enclosed workspaces for small and large groups, a soaring central atrium, a work café, and several outdoor spaces. 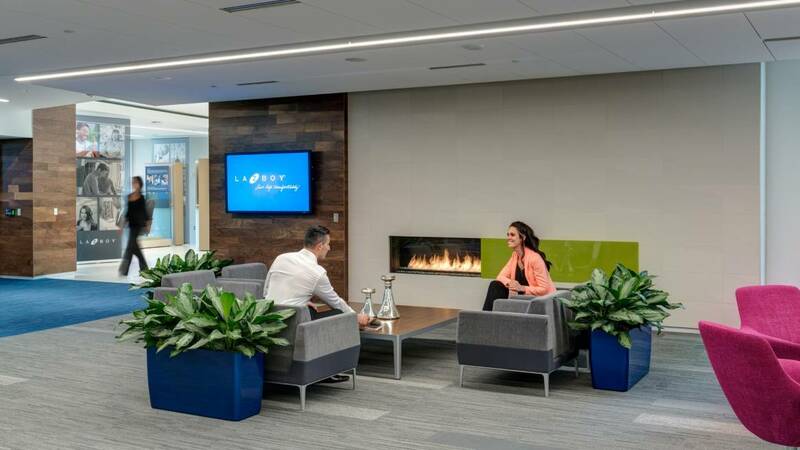 All employees have laptops and are encouraged to work not only in their departments, or “neighborhoods,” but anywhere they need to, from an outdoor deck to a lounge space with a fireplace. “We’re in the home furnishings business. We wanted a residential feel to our office,” says Mark Bacon, president of La-Z-Boy branded business. The new La-Z-Boy headquarters has a 20% smaller footprint than their former office, yet it provides 500 employees with a much wider ecosystem of spaces: unassigned individual desks, a wide variety of open and enclosed workspaces for small and large groups, a soaring central atrium, a work café, and several outdoor spaces. La-Z-Boy nailed the warm and welcoming residential feel, along with something else: a sense of a workplace that is human-centered, and is designed to inspire people at work. Some of this springs from an emphasis on employee wellbeing in the work environment. 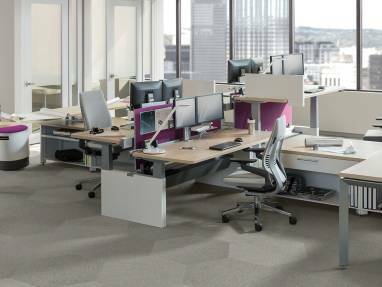 Height-adjustable desks are everywhere, including the 150-person call center, so every user can find the right fit. 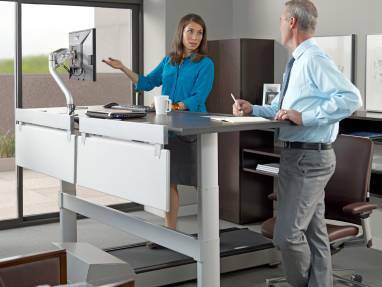 Along with Walkstation treadmill desks, user-adjustable monitor arms and ergonomic office seating, the work environment encourages multiple postures and movement. 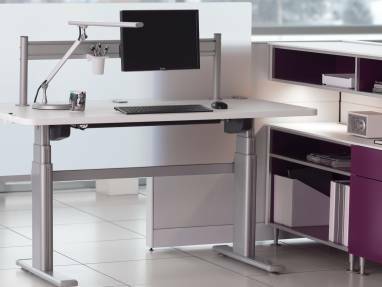 Height-adjustable desks are used throughout the new facility so every user can find the right fit.The work environment encourages multiple postures and movement. Natural light courses through the building’s three floors and floods the atrium, a popular space to work, break, meet and collaborate. The adjacent work café offers healthy food and free coffee, tea and fruit. This is a diverse ecosystem of spaces that supports varied work processes and workstyles. Most workspaces are open, providing easy communication and connection; even the private offices (fewer than 20) have glass fronts to keep the space open and encourage transparency. 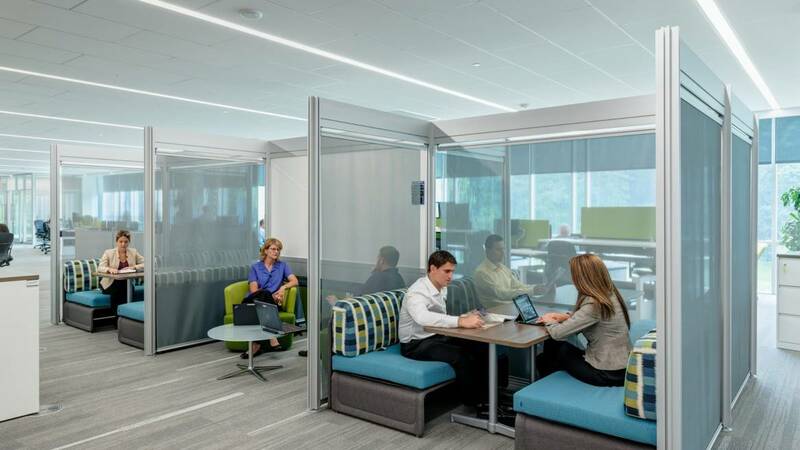 Collaboration spaces —more than 120— support both impromptu and scheduled meetings, and are never more than a few steps away. 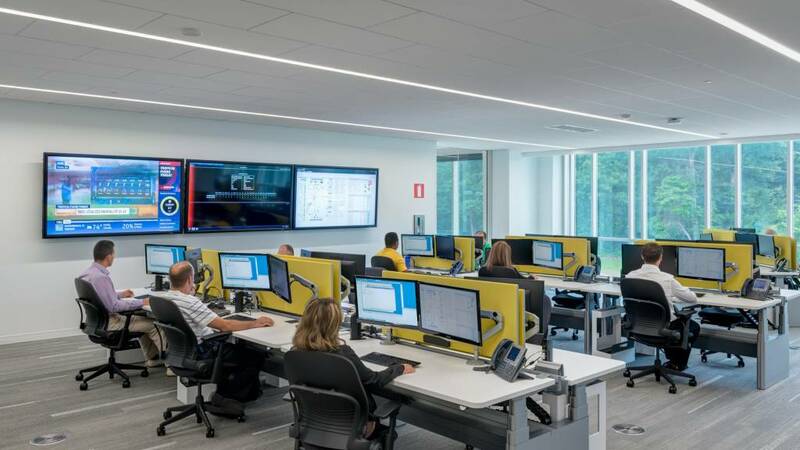 Leadership credits the new work environment with driving important changes at La-Z-Boy: greater employee enthusiasm, more communication and more frequent collaboration. The new space also has drawn rave reviews from customers, dealers, suppliers and the local community. “Getting people to come to a small town used to be a challenge. Now, we have people saying, ‘This is an unbelievably cool office!’ ‘I want to work in this space!’ We’re attracting the rock stars to come here now,” says Susan Vanisacker, director of community relations and talent acquisition. 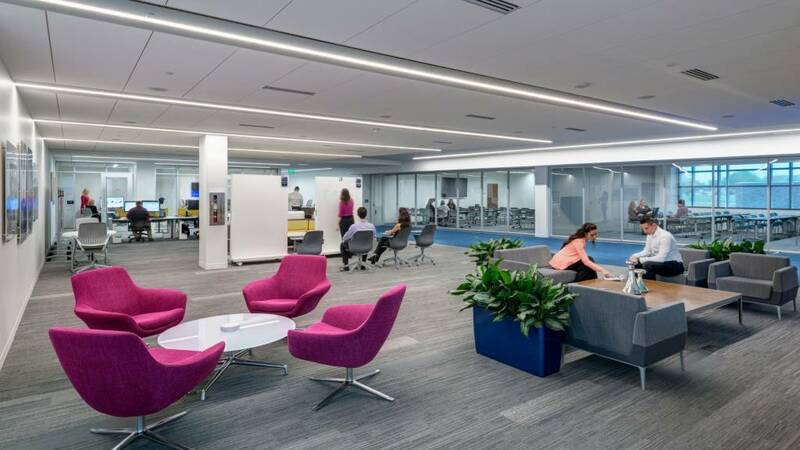 “As a result, we’ve got a great mix of new and experienced employees, and the space helps everyone communicate and collaborate like we never could before.” Employees are more engaged, behaviors are changing, and the organization’s culture is evolving as it nears the start of its second century in business.